Artist's illustration showing NASA's Cassini spacecraft flying by the huge Saturn moon Titan on Sept. 11, 2017. After a "goodbye kiss" with Saturn's huge moon Titan, NASA's Cassini spacecraft should now be on course for its suicide dive into the ringed planet Friday (Sept. 15). 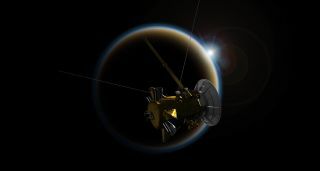 Cassini zoomed within 73,974 miles (119,049 kilometers) of Titan Monday (Sept. 11) in a flyby designed to lower the probe's orbit enough to ensure that it will crash into Saturn's thick atmosphere as planned on Friday, NASA officials said. "Cassini has been in a long-term relationship with Titan, with a new rendezvous nearly every month for more than a decade," Cassini project manager Earl Maize, of NASA's Jet Propulsion Laboratory in Pasadena, California, said in a statement. "This final encounter is something of a bittersweet goodbye, but as it has done throughout the mission, Titan's gravity is once again sending Cassini where we need it to go," Maize added. Mission team members should know for sure whether Cassini is lined up properly for its death dive after a scheduled check-in with the probe this evening (Sept. 12), NASA officials said. That death dive was planned because Cassini is running out of fuel, and the spacecraft's handlers want to make sure the probe is disposed of properly before they lose control of it. The main goal is to make sure that Cassini doesn't contaminate Titan or fellow Saturn satellite Enceladus with microbes from Earth. Scientists think both moons may be capable of supporting life. The 313-mile-wide (504 km) Enceladus harbors an ocean of liquid water beneath its icy shell, and hydrothermal hot spots within that ocean may provide energy for organisms, if any exist there. Titan, which is 3,200 miles (5,150 km) wide, is also thought to possess a subsurface water ocean. Titan also has lakes and seas of liquid hydrocarbons on its surface. Both of these environments may be habitable — though any life that swims about in the surface seas would be very different than the organisms we're familiar with here on Earth.